Every Disney fan should visit the parks at least once during the holiday season. Between the festive decorations, elaborate shows, and one-of-a-kind special events, Disney World becomes even more magical than usual in December. You can see life-sized houses made of gingerbread, towering Christmas trees topped with ornaments the size of basketballs, and the man of the season himself, Santa Claus, when you visit Disney in December. Look for your favorite Disney characters dressed up their own festive holiday gear, and snag an autograph or holiday photo with Mickey, Minnie, and friends. If you have the whole family together for Christmas in Disney World, head to one of the deluxe resorts to have a family portrait taken by a PhotoPass photographer. Visit Disney World early in the month to enjoy the holiday decorations and festive atmosphere without the crowds. The closer you get to Christmas, the more crowded the resorts and theme parks get. If you do go during a peak time, use every option you have to reduce the time you spend waiting in line, including FastPass+, Rider Switch passes, and single rider lines. Keep in mind that while Disney resort pools are heated, it may be too cold to swim in December. December brings cool but comfortable daytime temperatures and chilly nights to Disney World. On rare occasions, the mercury dips below freezing. The mild daytime temperatures make winter an ideal time to enjoy most of the Disney World theme parks, though it may be too chilly to enjoy water rides. The Orlando area receives an average of 2.24 inches of rainfall in December spread over an average of eight days, making it one of the drier months. In the early part of the month, the park operates on shortened hours, with about 10.5 hours between sunrise and sunset. Extended hours are the norm during the busier holiday season in the last two weeks, however. Bring a light jacket or sweater for mornings, and expect to don a winter coat in the evening. Many of the holiday events in December take place after dark, so come prepared for cold weather. Wear layers during the day in the park so you can put clothing on or take it off as the temperature changes. All of Walt Disney World gets into the Christmas spirit with elaborate decorations, holiday music, and family-friendly festivities. Some special events require you to purchase additional tickets for admission. 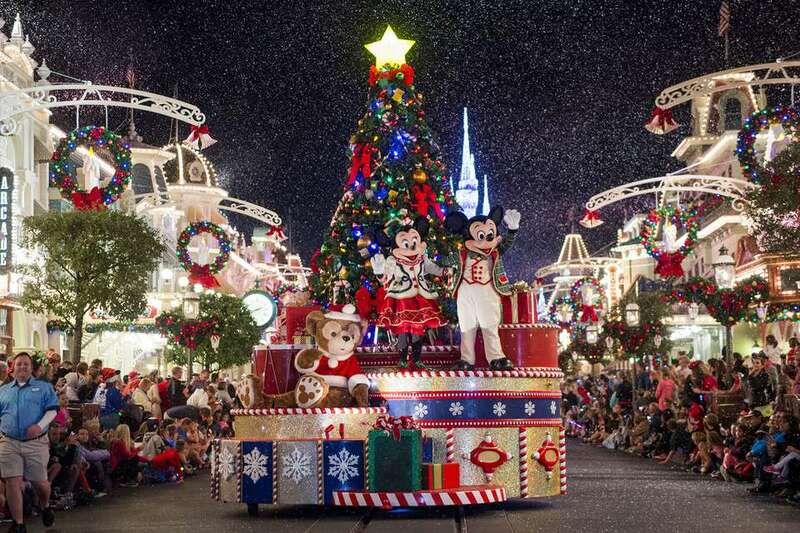 Mickey's Very Merry Christmas Party: Santa Claus joins Mickey Mouse at the Magic Kingdom for a jolly Christmas celebration sure to thrill the youngsters in your family—and the young at heart. Disney characters don their holiday finery while joyful music plays and favorite attractions light up with holiday theme decor. Epcot International Festival of the Holidays: With music, costumed performers, and seasonal food and drink specialties, this festival shares the holiday traditions of Epcot's 11 World Showcase nations. Candlelight Processional: With a celebrity narrator, 50-piece orchestra, and enormous choir, this performance at Epcot brings the biblical story of the birth of Jesus Christ to life. Jingle Bell, Jingle Bam! Holiday Dessert Party: Watch the fireworks at Disney's Hollywood Studios from the reserved seating area while you enjoy sweets and treats. Holidays at Disney Springs: Sing carols and take photos with Mr. Christmas himself at Santa's Chalet at Disney Springs. New Year's Eve At Walt Disney World: Ring in the New Year while you enjoy dining, dancing, and a dazzling fireworks display. December is a very busy time at Disney World. You may find pockets of low activity in the early part of the month, but for the most part, expect to see some crowds. Take advantage of the longer holiday hours to see everything you want to when you visit the Disney theme parks. Note, however, that the Magic Kingdom closes early on Mickey's Very Merry Christmas Party nights. If you are traveling with a baby or toddler, look for quiet spots for nap time on the go. If restaurants are crowded at lunch or dinnertime, switch your meal times to more "off" hours, and grab one of Disney's best snack offerings while you wait. Allow extra time to get from place to place on the Disney transportation system during the busy holiday period. Make Advanced Dining Reservations (ADRs) before your trip for most table-service restaurants. You can make an ADR within 180 days of your visit. The closer to Christmas week your vacation dates fall, the harder it will be to secure a table at a restaurant without a reservation. To learn more about the pros and cons of visiting Disney World during December, check out our guide on the best time to visit.